Aussie traders, huddle up! We’ve got a top-tier catalyst comin’ up from the La La Land Down Under this week in the form of a quarterly GDP report. If you’re thinking of trading this release, make sure you take note of these things. First off, keep in mind that Australia just printed weaker than expected headline GDP readings for two consecutive quarters, which suggests that there could be a good chance of the actual figure undershooting forecasts once more. Analysts had been expecting to see a 0.2% expansion for Q3 2016 but were surprised to find out that the economy contracted by 0.5% in reality. The Q2 reading also came in a notch lower than the 0.6% consensus, although it enjoyed an upward revision later on. In fact, several revisions to previous releases can be seen, which goes to show that these folks don’t always get things right the first time. Maybe they got the wrong card? This also explains why the Aussie tends to have a muted reaction to the official release, but more on this later on. For Q4 2016, a rebound of 0.7% is expected as the previous drag from a huge slump in government investment isn’t likely to come into play. Aside from that, the economy probably got a big boost from trade activity since its December surplus grew to $3.5 billion due to a 5.4% jump in exports, following another trade surplus in November of $2.04 billion. To top it off, business credit picked up pace in the last three months of 2016, likely translating to an increase in investment. Housing loans posted an increase, also another plus for investment activity, but consumer spending likely slowed on weaker personal credit and retail sales for the period. Also, keep in mind that the RBA projected that Q4 growth will come in at 2% year-over-year, at least according to its February Statement of Monetary Policy. 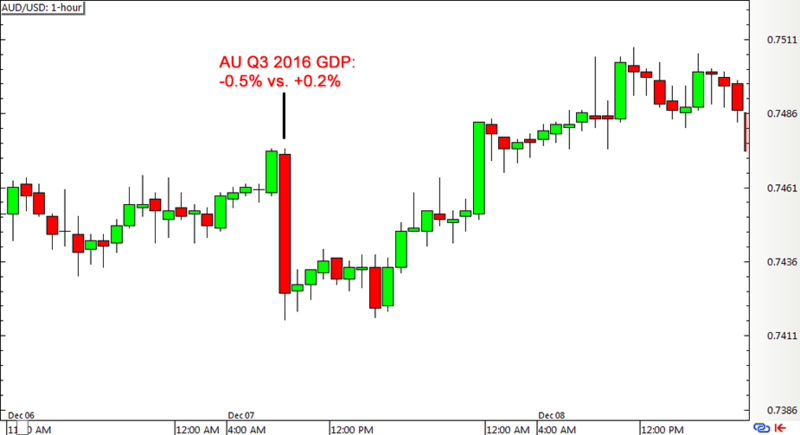 As mentioned earlier, the initial reaction of AUD pairs to the quarterly GDP report doesn’t tend to last, possibly because traders are still holding out for revisions later on. For AUD/USD, price made a sharp drop upon seeing the headline figures but didn’t head much further south. 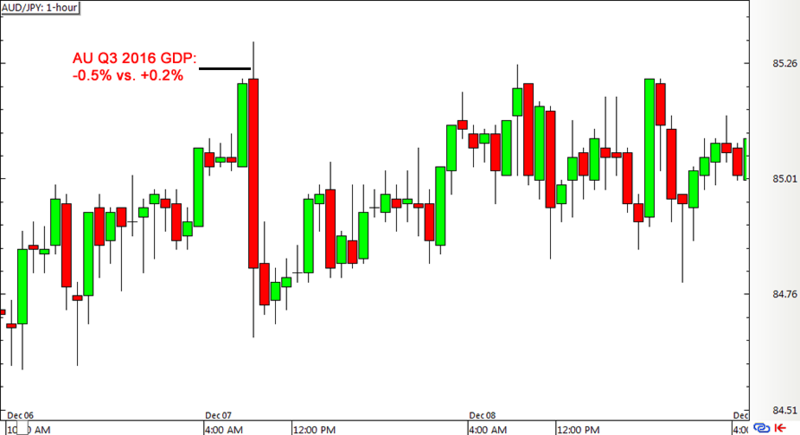 In fact, price bounced off its intraday lows and proceeded to reverse the entire move in the succeeding sessions. AUD/JPY also had a strong initial reaction to the data miss but it eventually recouped its losses until the next Asian session. If you’re trying to scalp pips off this report, you might want to consider waiting for the initial move to pan out then fading the reaction at least until the intraday highs or lows. What’s your game plan for this report? Don’t be shy to share your thoughts in our comments section below!